Duluth has a huge choice of cross-country trails within the city limits. Locals cherish the diverse trails where you can always find something new to explore. Visitors will find trail maps with detailed information and helpful rental staff ready to give advice. To access the many public trails all around Duluth a Great Minnesota Ski Pass is a must. 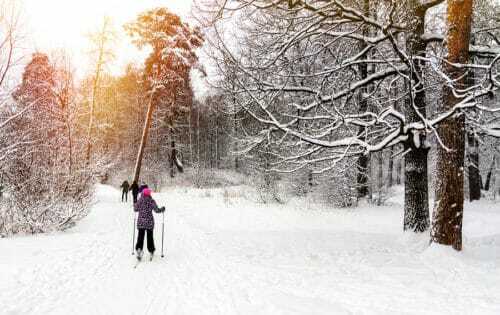 A day pass to all the Minnesota state parks or state forests trails will only cost $6 per skier. The Skinny Ski site also has up-to-the-minute trail condition reports and will help you plan your day in the snow. Since many visitors may not bring their own skis, Duluth has two great full service ski rental shops. Both carry high quality equipment, in addition to apparel and accessories. Also the friendly and knowledgeable staff can give you insider tips and advice. SkiHut specializes in Nordic Skiing, more commonly known as “Cross-Country.” Also check out Continental Ski & Bike to get you ready for a fun day in the snow. Lastly, keep safety in mind when heading to the trails. Never ski alone or without leaving a plan and a return time with someone. Take a map of the trails and be sure to pace yourself. Be realistic about your abilities and skiing level. After feeling confident on the flat, gentle beginner trails, move up to the longer hilly intermediate ones before jumping into a steep advanced trail with lots of sharp turns. Stay safe and enjoy your adventure! Duluth is unique in that the city has 45 kilometers of trails just minutes from downtown. You can be at a city coffee shop in the morning then, after a short drive, in the wilderness skiing along creeks and over hills. Many of the local trails have beautiful forests, stunning overlooks and great views. Piedmont Trail – This 5.5-kilometer trail is great for beginners and intermediates with a wonderful overlook with views of the St. Louis River valley. Lester-Amity Ski Trail – A very popular 15-kilometer trail close to downtown. The 4-kilometer loop on the Lester Park Golf Course is good for beginners and has lighting in early morning and evening. Magney-Snively Trail – A great 14-kilometer trail for intermediate and advanced skiers that travels through heavily forested hills. It also includes overlooks with views of Duluth and Spirit Lake. Chester Park – This 3-kilometer trail is very hilly and for advanced skiers only. The Hartley Nature Center – This nearby ski center offers equipment rentals and 5 km of beginner to advanced cross-country skiing trails. Snowflake Nordic Center – This place was designed for Nordic skiing lovers and the owner, George Hovland, skied for the US in the 1952 Olympics. It’s worth a visit just to meet George and chat about skiing, the weather and the world in general. Visitors will also love the full service facility with warm chalet, rentals, lessons and even a biathlon range. 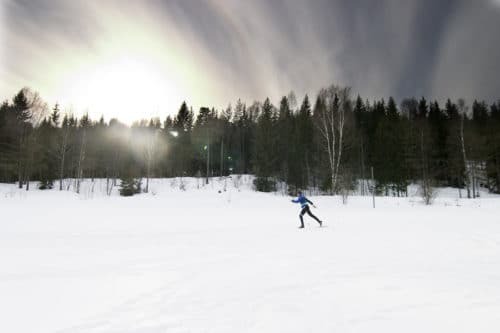 Spirit Mountain Nordic – In partnership with Duluth Cross-Country Ski Club, Spirit Mountain Recreation Area offers cross-country skiers 22 kilometers of beautifully wooded trails. In Duluth we take our cross-country skiing very serious and that’s why we love the variety of trails to explore. Spend winter days skiing the snow-covered forest trails, then warm up at the lively local bars and restaurants. Exceptional skiing makes winter one of the best times to plan a Duluth getaway. Reserve your elegant guest room at the Solglimt B&B today.